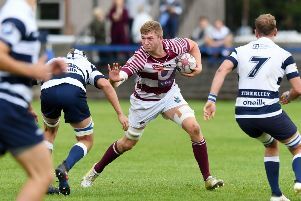 Former Edinburgh Rugby head coach Alan Solomons has spoken of his pride at seeing young talents that he helped bring into the professional game a few years ago now playing a big part in the club’s revival. It is nearly two years since the South African-born coach left the Capital, stepping down in September 2016. He had taken over from Michael Bradley in 2013 and led the side to the 2014/15 European Rugby Challenge Cup final where they lost out to a Gloucester side featuring Greig Laidlaw. The club’s league campaigns were quite disappointing under him, two eighth place finishes followed by ninth in 2015/16 in the PRO12 as it was then. After he left, the remainder of 2016/17 was tough for acting head coach Duncan Hodge, finishing ninth again, before current head coach Richard Cockerill took them to the play-offs in the new-look PRO14 last term. Solomons, 68, is now director of rugby at Worcester Warriors in the English Premiership and he said: “Part of me and my coaching staff coming into Edinburgh was with a plan of bringing through the young players and I think that we were able to do that very successfully. “Back then when I started and was quite new to the club guys like Rory Sutherland, Allan Dell, George Turner [now at Glasgow], Ben Toolis, Hamish Watson, Jamie Ritchie, Magnus Bradbury, Sam Hidalgo-Clyne [now at the Scarlets], Chris Dean, Damien Hoyland and Blair Kinghorn were very young and making their way in the game. “We managed to give these guys first team opportunities and help them come through the ranks and it is so great to now see them all doing well. “They are now all established professional players, most of them still with Edinburgh, and in fact most of them now have Scotland caps and I am pleased to have played my part in their progress. “Take guys like Jamie and Blair for example, we took them straight from school into a pro group which was unheard of in Scotland at the time and put structures in place to help them do what they are doing now. “They are superb players with big futures. “For Edinburgh to flourish we had to play a longer game and bring those players through slowly but sure because at the time the Scotland team was filled with Glasgow players.